The event promises to be even better than last year’s conference. has been considerably updated and you can see all the details and register for the event there. The format is similar to last year with global updates, special projects, research papers, panel discussions. There will be 4 workshops this year though and you can again expect some surprise announcements of new initiatives! Since we are limited to 100 participants you may wish to register soon. We will use a different Internet platform to last time. Smartphone access will also be possible. Please see the attached pdf which you may wish to print out and display in some suitable place. This means the book is now available in 6 languages. Many thanks to Mr Krishnamurthy. See this excellent introductory video from Sivaram Pusapati in Japan. Here is the link to the Japanese version introduction video. There are several in-person courses coming up, in Bangalore, Bhopal, Pune, etc. especially for children. See our Calendar of Events. If you have completed the Teacher Training or Diploma Course you can go on to our Advanced Course. The first five and a bit chapters of the "Natural Calculator" book have now been integrated into the main website (now being compatible with Smart Phones and Tablets etc.). These can be found at the "Tutorial" menu in the "vedicMaths.Org" website. It should be noted that the above chapters effectively form a mini course in basic multiplication. VM at Teacher's Conference, Houston, TX. The Goswami Academy and Gokul Kidz of Houston along with Goloka Education had presented a week of professional development for primary and early year’s teachers. At the request and kind invitation of their school principal, Ms. Shabashini Lind, I conducted a two-day seminar on Vedic Mathematics (VM). The audience consisted of teachers of pre-K and elementary grades. As a trained teacher of Vedic Mathematics from the Vedic Mathematics Academy, I had been privately teaching Vedic Math to middle and high school students, but conducting a VM seminar at the pre-K and elementary grade level, let alone, training teachers, was a tough challenge. The school board had communicated their interest to add VM to their fall curriculum. So, as daunting as it appeared, I became very eager to present at the seminar the beauty and benefit of this ancient yet cohesive, simple and straightforward subject matter. Goswami Academy is a primary school designed to serve children in grades pre-pre-K through Grade 5 (ages 3 – 9). It provides a strong foundation to nurture creative academics and spiritual values in their students. The Academy provides a balanced spiritual and academic education that enables their children to realize the harmonious relationship between the divine, the soul, the body, other living beings, and the environment. The teachers are well versed in the essence of the Vedas. Therefore, if there was one quality that I knew about my audience, it was undoubtedly their knowledge and depth of the Vedas, primarily of the 5000 years old text of the Bhagavad Gita, written in the Sanskrit language. What could have been more appropriate than to allude to the 16 Sanskrit sutras (aphorisms) and 13 sub-sutras (corollaries), given to the world by the proponent and master of Vedic Mathematics, Sri Bharati Krsna Tirthaji? In my first three-hour morning session, I kicked off the seminar with an overview of the history of Vedic Mathematics. My carefully crafted PowerPoint slides encapsulated the richness of Vedic Mathematics history and culture, with the hope to make it interesting for the teachers. We discussed 7th century Brahmagupta use of 'zero' in Gwalior-India, his work on negative numbers and quadratic equations with two solutions (Fermat only came with this idea in 1757, 100 years later than Brahmagupta). The audience was fascinated about Bhaskar's concept of infinity. The excitement in the room was slowly growing, the audience became more engaged, and my task to uphold this level of excitement grew harder. I elaborated on the India's fifth century Mathematician ---Ayrabhata--and his treatise called Aryabhatiya. 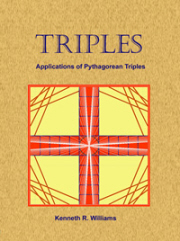 It covers arithmetic, algebra, plane trigonometry, and spherical trigonometry. It also contains continued fractions, quadratic equations, sums-of-power series, and a table of sines. That is, the ratio of the circumference to the diameter is ((4 + 100) × 8 + 62000)/20000 = 62832/20000 = 3.1416, which is accurate to five significant figures. Aryabhata used the word āsanna (approaching), to mean that not only is this an approximation, but that the value is incommensurable (or irrational). This is quite a sophisticated insight, because the irrationality of pi was proved in Europe, only in 1761 by Lambert. There was no better way to end the first session by speaking about Sri Bharati Krsna Tirthaji and his monumental contribution to Vedic Mathematics. We reviewed Tirthaji's life, his challenges, and his extensive work from the Parisista (appendix) of the Atharva Veda, when he developed the 16 Sanskrit sutras and 13 sub-sutras of Vedic Mathematics. The teachers were very touched by Tirthaji's proficiency in Sanskrit. The last slide for the day had set the scene for the following day. I had outlined the 1965 posthumously published work of Tirthaji's “Vedic Mathematics.” It is this introductory volume that is available to us now which itself covers Multiplication, Division, Squares, Square Roots, Cubes, Cube Roots, Factorization, Simple & Quadratic Equations, H.C.F, L.C.M., Decimals, Fractions, Compound Multiplication and much more. My audience showed great exuberance for the next day's hand-on session. They wanted to experience these sutras first hand! Our second and last session did just that. I selected ten of the sixteen aphorisms to show the cohesiveness and simplistic nature of Vedic Mathematics. By demonstrating the Left to Right approach of Mathematical operations, I showed them how VM relates to natural mental functions -- it works the way the mind naturally works! The audience’s reaction was clear. In the midst of the murmurs and chatters, someone from the audience had shouted, "this is so easy!" I demonstrated an application of the first of the 16 sutras, "by one more than the one before" (ekadhikena purvena). We specifically reviewed squaring numbers ending in five by using this sutra. Thus, the teachers were able to compute confidently 35*35 or 4.5*4.5 in no time. Their excitement grew abound. I then elaborated on the VM principle of carry, in the four Mathematical operations-- addition, subtraction, multiplication, and division. To demonstrate this idea, we looked at the VM approach of multiplying numbers with 11. We looked at 3167 * 11. After a short break, we convened again to look at the second of the 16 sutras, Nikhilam navatascaramam Dasatah -- “all from 9 and the last from 10.” The formula can be effectively applied in multiplication of numbers, which are nearer to bases like 10, 100, 1000, that is, to the powers of 10. The procedure of multiplication using the Nikhilam involves minimum number of steps, space, time saving, and only mental calculation. The ebullient crowed pressed their pen to their paper, and solved all the problems on the board. We expanded this method by practicing operations that were more complicated. Thereafter, we reviewed addition and subtraction using the base method. Additionally, I illustrated the rules of the method (near to the base 10 and 100) in multiplication. This novel approach was well received among most, but not all of the teachers. A few skeptics lurking in the room were still trying to intellectualize the VM methods and their merits. In the Q&A session, someone asked about how VM handles negative numbers when applying this sutra. I explained that the difference between the number and the base (termed as deviation) might be positive or negative. Positive deviation is written without the positive sign, and the negative deviation is written using ‘rekhank’ (a bar on the number). We concluded the seminar with more Q&A and feedbacks. We played the ‘one word’ feedback game. Among the responses, I recollected “original,” “natural,” “powerful,” “creative,” “fun,” and “flexible.” Unarguably, the two sessions met the expectations of the conference. There was compelling evidence that the audience was less nervous but more convinced about Vedic Mathematics. It was a pleasure and honor to present Tirthaji’s Vedic Mathematics to a conventional school system. School principal, Shabashini Lind and the school board has now added Vedic Mathematics to the pre-K and elementary grades curriculum at The Goswami Academy. [Krishna Kirtan Das is a Statistician for a renowned firm in U.S.A. He graduated from University of California, Santa Barbara with a degree in\Actuarial Mathematics. Currently, and he and his family live in California, where he teaches Vedic Mathematics via Skype and online portal. He has also introduced VM at faith-based schools in Los Angeles. Contact: ].